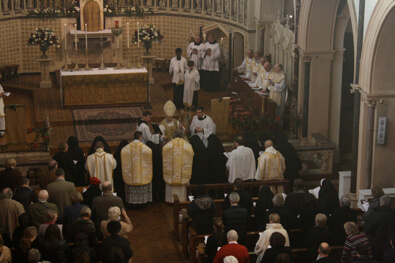 On the Solemnity of Mary, The Holy Mother of God, ten sisters from the Community of Saint Mary the Virgin at Wantage were received into full communion with the Catholic Church, and twelve sisters in total formed the first Sisters of the Blessed Virgin Mary, within the Ordinariate of Our Lady of Walsingham. The Ordinary, Mgr Keith Newton, received the sisters' profession of faith and conferred on them the sacrament of Confirmation. Today sisters, you can say the same, for you become one with St Gregory the Great, St Augustine of Canterbury, St Benedict, St Edward the Confessor and all those holy men and women who have been signs through the ages of God’s providence. For nearly half a millennium the Church in England has been divided, cut off from the Universal Church, but three hundred years after the rupture in the Christian life of our nation there came the Oxford Movement – a movement to recover what had been lost in the destruction of the sixteenth century. On 2nd February 1848 two significant events which stem from this reawakening took place: John Henry Newman founded the English Oratory at Maryvale and William John Butler, the Vicar of Wantage founded the Community of St Mary the Virgin. The history of this community is a noble and illustrious one. For 164 years you have been faithful in prayer, especially in the liturgical offices, in caring for the poor, the sick, the abandoned and the elderly, in educating the young, and in missionary work in India and Africa. There have been countless achievements artistically and musically too, but if we were to single one thing out about this community it is surely to be found in its name: The Community of Saint Mary the Virgin. It was begun on the feast of Our Lady’s Purification, her name has been invoked throughout its history and it is her maternal care that has brought you to this new stage in your journey to your homeland in heaven, as the Sisters of the Blessed Virgin Mary. Today is appropriately the Solemnity of Mary the Holy Mother of God. If we wish to know what the Church truly is, then it is to Our Lady that we can best look. She is the first of the redeemed, the temple of the Holy Spirit, and the icon of humanity raised up above the angels and enjoying the fullness of heavenly bliss. The greatest of Our Lady’s titles is the one that we celebrate today: Mother of God. How astonishing it is that God should choose to be dependent on one of His own creatures, that she should carry in her womb the One who sustains the whole Universe, that He should be so completely in need of sustenance from this one woman, that she should feed Him and nurture Him and even bring Him to grow in wisdom and in stature. In the same way it is the Church that makes Christ visible on earth today. He had to wait until the eighth day to receive a name from human beings – so He depends now upon us to make that Name known to the ends of the earth. 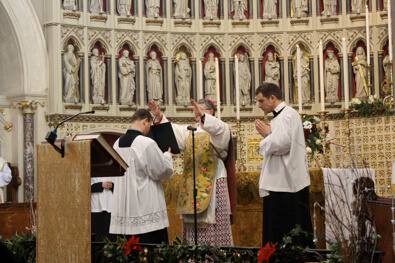 He was made visible in a human family in the flesh, so now it is through the Church that He continues to enter substantially into His own creation through the sacraments. And just as Mary treasured all these things and pondered them in her heart, so too the Church draws her life from the contemplation of those hidden mysteries entrusted to her. 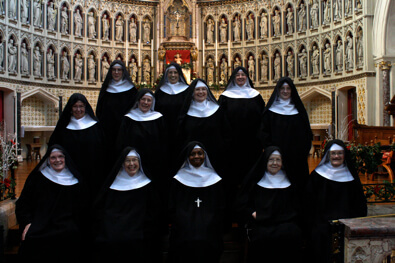 As contemplative religious, you dear sisters are summoned to be love in the heart of our Mother the Church, to treasure those mysteries so that they can be shared with the whole of humanity and to enter into that intimate union with the Lord so that you can be spiritual mothers, bringing Him to birth in the darkness of the world. The prophets had to wait over long centuries for the coming of the Messiah, so in God’s providence this is His chosen time when you are to enter into full communion with the Catholic Church. This is not a betrayal of what has come before, but it is the fulfilment of those vows you have already made and the fruition of the love and service of those generations of sisters who have gone before you. You have responded, generously and courageously to the Holy Father’s summons to unity and as such you put yourself at the service of Our Lord’s own prayer in the Cenacle that “they should all be one” as He and the Father are one. 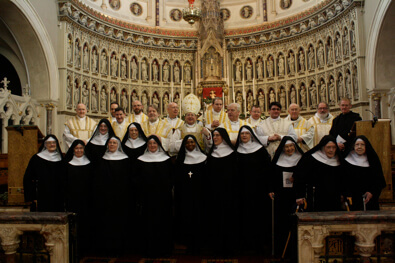 That may seem like a rather grandiose statement to make, and the Unity of the Church may seem an ambitious project to entrust to a small sisterhood. What can twelve women do? we might ask. We might have asked the same question about our Lord’s choice of twelve rustics from Galilee as His apostles. In faithfulness to His call, He can do great things in you. Mary and Joseph might have thought that it was unnecessary to take the child Jesus to be circumcised, but they were obedient to all the demands of the Law, for he was born as a subject of the Law. This Law came to its culmination in the person of this baby boy so that He could inaugurate the new Law of the Gospel. So everything that has come before for you has prepared you for the fullness of unity and truth which you profess and participate in today. On this day, the octave of Our Lord’s nativity, He first shed His blood and became manifest by being named. After the anticipation of the ages, God can be seen and touched and heard – even if only in a child’s crying. And above all, he can be named: He is Jesus the Son of Mary. Our Blessed Lady made all of this possible with the words which you have worn on your profession crosses as Sisters of Wantage: “Fiat Mihi secundum Verbum Tuum” – “Be it done unto me according to Thy word”. She was afraid, St Luke tells us, she lived by faith and did not see God’s plans from afar, but she trusted in Him so completely that there was nothing she would not do in obedience to Him. Our Saviour was born without a home. Shortly after His birth his parents had to flee as refugees to Egypt, where they must have struggled to find shelter, and food and work. They lived as strangers in exile, and yet they possessed the most precious thing there could ever be: the very Son of God. So Our Lady knows better than anyone what it is to set out in faith, having nothing but possessing everything, uncertain as to what the Lord’s plans may be but trusting that with Him nothing is impossible. She knew how to treasure and ponder all these things in her heart while still needing to wash and feed and care for her child. She lived in the world, subject to all its cares and demands, but she lived more truly in the contemplation of her divine Son. As her chosen daughters, you are called today to imitate her trust, and to know that as she has sheltered you under her protecting mantle up until now so she will continue to do so, especially as you identify yourselves with her and live the fullness of the Church’s vocation as she did. 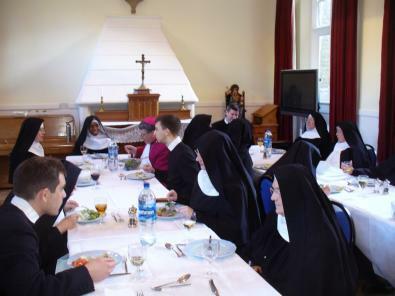 In the quest for unity, we know what Our Lady says, as she told the servants at Cana: “Do whatever He tells you”. Dear sisters, it has been a great privilege for me to accompany you during this past year on your journey into full communion with the Church. What you are joining is not anything alien or foreign, but your own birthright. 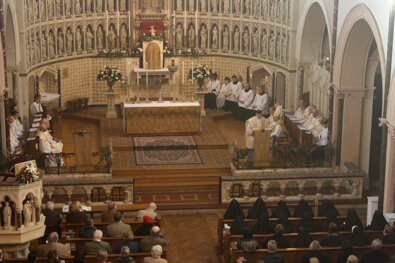 The spiritual genius of St Benedict, under whose Rule you are to live, the study and practice of the sacred liturgy, and the veneration and love given to the Mother of God – Our Lady of Walsingham – these are all part of the ancient glory of this country, which was once an island of saints and Mary’s dowry. In the Incarnation of the Son of God, a new beginning was made for the whole of humanity. Sin, death, pain and unhappiness were not to have the last word after all because the Word was made flesh. It is easy for us to look at the state of our society and to fear that Christianity is ebbing away, that five hundred years of division and unfaithfulness will lead to ultimate destruction and emptiness. But this season demonstrates that new beginnings are possible, that Providence can surprise us, that the Light of the World can always conquer darkness. You have your part to play in responding to this new beginning to which Providence has led you. We cannot see the future, and we do not need to, because Christ is the Lord of history. Years come and go, empires rise and fall, man’s folly waxes and wanes, but of this we can be sure: that the gates of hell can never hold out against the power of the Church, founded on the rock of St Peter. We have our Lord’s own words to assure us of this. When we look back in years to come on this day when you become visibly part of the Holy Catholic Church, and when this new community is established as a home of prayer and union with the Lord, we will see even more clearly than today how He has blessed you and kept you and made His face to shine upon you. As you look around this church, you may well feel that God chooses some very peculiar people to be His friends. Indeed He does! But this, believe it or not, is the communion of saints which keeps that faith handed down to us from the apostles. Our own weakness is not an obstacle to God’s plans, because it is His power alone that sustains us. He has not chosen us on merit, but He has adopted us as His sons and heirs, so that everything that belongs to Him belongs to us. And as the proof of this, as the pledge of the future glory that awaits us, He gives us His very self. Here we too can be astonished like the shepherds, as we behold Bethlehem, the house of bread. May our Lady, St Joseph, St Benedict, our Holy Father St Philip, Blessed John Henry Newman and all God’s friends intercede for you, so that your profession of the Catholic faith today may come to its fulfilment in the heavenly Jerusalem, and may it be said of you as of the shepherds: “They went back glorifying and praising God for all they had heard and seen; it was exactly as they had been told.”"